We’re sometimes asked about the SkyHawk 9600 binocular, which SkyHawk claims to be a competitor to the Oberwerk BT-100-45. So here is a brief history for those that are curious. Oberwerk entered the optics business in 1999, SkyHawk Optics was founded in 2002. 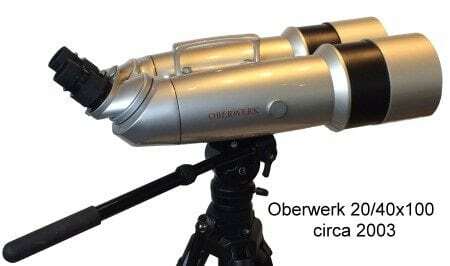 At that time, a number of companies, including SkyHawk, were importing what is now known as the Oberwerk 25/40×100 Long-Range Observation binocular. 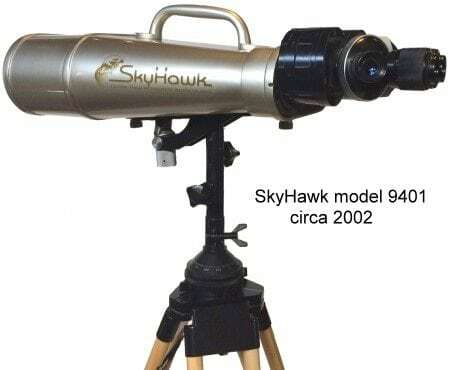 SkyHawk called their binocular the model 9401. In 2003, Oberwerk was offered a smaller and lighter 20/40×100 by another Chinese optics manufacturer. This new model was an unabashed clone of the highly-regarded Japanese-made Miyauchi Bj-100iB, but had a retail price that was a fraction of that of the Miyauchi, and also half that of our BT-100-45. From an optical-quality standpoint, it was quite good considering the low price, but not in any way a competitive threat to our higher-end products. So we proceeded with a small order of 12 units to fill a price gap in our product line. Shortly after adding this new binocular to the Oberwerk website, we were contacted by Miyauchi, who was understandably “not flattered” that a Chinese company had copied the design of their binocular. They asked us to not carry this product, and in exchange, they would give Oberwerk lowest-possible dealer pricing on Miyauchi products. We accepted Miyauchi’s offer, and removed it from our product line. It was a fortuitous decision- within a year we became the largest Miyauchi dealer in the USA, out-selling all other dealers combined for 7 straight years, until Miyauchi ceased production in 2010. A few years after the Miyauchi agreement, Oberwerk formed a joint-venture with Yunnan Opto-Electronics, and obtained exclusive rights to the 25/40×100 Long-Range Observation Binocular for North America. This left SkyHawk in a dilemma, as they could no longer obtain the model 9401. So they introduced the “new and improved“ model 9600, which- you guessed it- was the Miyauchi clone that we discontinued at Miyauchi’s request. Some minor cosmetic changes were made, and 25x eyepieces were supplied instead of 20x. But the big change was the price- which exceeded the higher-end Oberwerk models! Attempting to justify this, SkyHawk created a wildly-inaccurate comparison between the 9600 and the Oberwerk BT-100-45 on their website. Keep in mind, we briefly carried their 9600 binocular as a low-price alternative to our BT-100-45, but for those wanting higher quality, the BT-100-45 was worth twice the cost. A Google search for reviews of the Oberwerk BT-100-45 will return numerous favorable reviews on astronomy-oriented websites. The same search for the SkyHawk returns zero reviews on astronomy-oriented websites- draw your own conclusions. We could go through the Skyhawk website’s “SkyHawk vs. Oberwerk” comparison point-by-point and show the many errors and inaccuracies. But today, none of this matters, as you’ll soon see. From the start, Oberwerk has been an innovator, continually improving and evolving our product line. In 2015, we began development on an entirely new line of binocular telescopes, and when the XL Series was finally introduced in 2018, it changed everything! Available in three sizes, 70mm, 82mm, and 100mm, the XL Series (XL=”to excel”) utilizes exotic ED (Extra-low Dispersion) glass objective lenses, which eliminate chromatic aberration (or “false color fringing”), combined with radically-different prisms, which take image quality at high magnification to a new level. They have a beautiful sleek design, with ultra-lightweight magnesium-alloy construction (XL=”Xtra-Light”), and are finished in a lustrous “Luna Pearl” White with red-anodized accents. 1) The BT-82XL-ED optically outperforms our larger BT-100-45, as well as the 25/40×100 Long-Range Observation binocular- and of course absolutely trounces the Skyhawk 9600. Like all XL models, it includes the finest eyepieces we’ve ever produced- a wide-angle 70° 14mm pair that delivers 32x in the BT-82XL-ED. The view is so spectacular that you may not need any other eyepieces. But if you want to go higher, you can take it to 64x, with excellent clarity and sharpness (and with much better image quality than the Skyhawk at 40x). 2) The BT-82XL-ED is an incredibly-light 10.3 lbs. Even the BT-100XL-ED is just 12.5 lbs., while the SkyHawk weighs in at 17 lbs. 3) Mount this on our 5000 Series tripod/head and the total cost is $1975 ($525 less than the SkyHawk). By the way, the Oberwerk 5000 Series tripod/head is the same tripod, from the same manufacturer, that comes with the SkyHawk- but ours has a few custom upgrades. The 5000 has longer leg sections for more height range and also greater strength (with more leg-section-overlap). Our 5000 is black-anodized (instead of silver) and comes with two quick-release plates and dual panning handles. 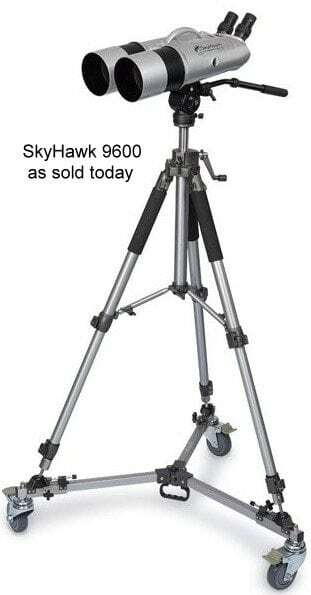 Note that SkyHawk charges a whopping $525 for their tripod, while our upgraded 5000 tripod is just $279. Seeing a pattern? 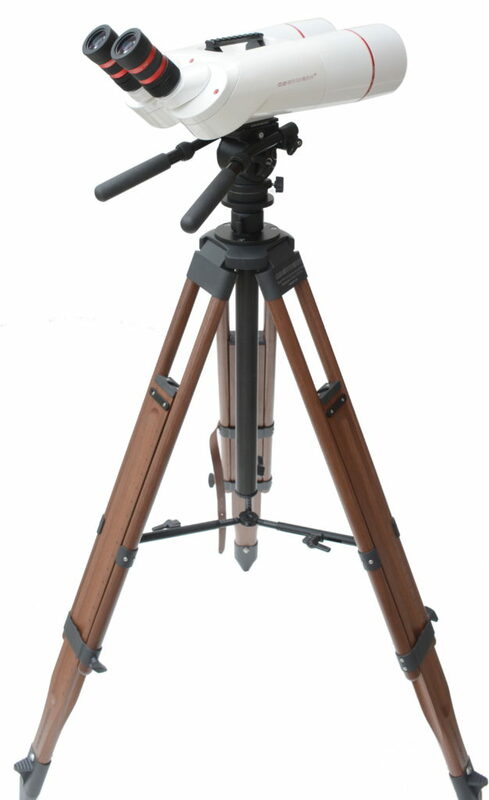 We also offer the gorgeous American-made Oberwerk TR3 hardwood tripod, available in 3 hardwood choices and 4 stain colors, and rated for up to 40 lbs. capacity. Equipped with a carbon-fiber elevator, for up to 18″ of instant height adjustment, topped with the 5000 fluid head with dual panning handles, it’s exceptionally sturdy and functional. Even with a TR3 hardwood tripod, the BT-82XL-ED is $100’s less than the SkyHawk. XL binoculars are so lightweight, a dolly just isn’t necessary. But we do offer the Italian-made Manfrotto Auto-Dolly as an option. The black low-profile Auto-Dolly doesn’t noticeably detract from the tripod’s beauty, and the single-foot-pedal wheels-up/down feature is pretty slick. For those that want the very best, the BT-100XL-ED, mounted on a TR3 hardwood tripod, is the most elegant and highest-performing binocular setup on the planet- with a total weight just over 20 lbs. and a total cost under $3000. Optically superiority aside, which of these would you rather have in your living room? Finally, consider service and support. We have full-time staff ready to help by phone (9-5 Mon.-Fri.) or email (24/7). When you place an order, either online or by phone, your binocular will be set up, tested and tuned to perfection (including alignment on our collimator), and your custom hardwood tripod will be assembled- all at our facility in Dayton, Ohio, typically within 24 hours. If something happens to your binocular long after it’s out of warranty, only Oberwerk has the knowledge, experience, specialized tools and complete parts inventory, to handle any type of problem or repair. Sorry SkyHawk- it’s “game over” for the 9600.